Tales of a Media Addict. : Life in a Barracks. Its a real switch, being 31 years old and suddenly being in an environment where you have to share a room with a stranger, eat a dining facility (though only if you want to), and be in a place where people want to know if you are leaving (at least if you go more than 150 miles). At least I don't have to make my bed if I don't want to, and so long as I don't live like a pig the room is me and my roommates. Then you add in things like sharing a bathroom, common laundry facilities and its just so different. 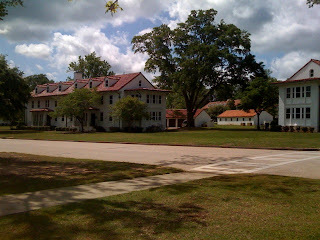 I keep slipping up and calling the barracks "dorms", since that is what it really feels like. Excuse the mess a bit, since these were taken on the first day and I was still getting settled. Its also an abrupt change from being used to be able to spread your stuff all over a full 1000sqft condo and then being reduced to this small area. A lot of tricks that were common when you had them back in those first years of college have slipped your mind and lead to some last minute purchases (like the hanging drawers in the wall locker photo). Then you have to add in a whole bunch of other equipment, rucksacks, body armor, and several duffel bags of gear. Its an art sorting and storing it away. My roommate is a bit more put together but this is also due to the fact that he just spent 13 weeks living like this in the Federal OCS program. Being on an Army base really for the first time with freedom (I was at Ft. Knox during basic, total lockdown, Ft. Pickett, Camp Dawson and Fort McLellan for OCS where you also were on lockdown while you were there) is very different. I do have some familiarity with military bases, being that I am a Navy brat, but actually living on a large base like this is an experience. They have a post office, several bowling alley's, a couple of straight up bars (there is one literally a minute walk from my barracks. Things like this are great in cutting down on drunk driving since soldiers don't even have to leave the base and they even operate a shuttle around the main areas), a fairly modern movie theater (run by a commercial company but only usable by military and their dependents), several gas stations, a couple of chapels, several convenience stores, a number of fast food places (BK, Subway and others), a large PX (post exchange) and of course a commissary. That and some pretty nice gyms and trails. There are some days that I don't even leave the base. Its a different community here on post compared to what I am used to. Very much like those images of the 50's where the kids can go anywhere safely, there are lots of things to do and everyone, even the drivers, are fairly polite. Even the base housing is kind of neat and nice looking. Just a very different world from what I am used to... And something that I don't really sample as a National Guardsman, where all this stuff is the exception rather than the norm as it is for the Regular Army folks. It does remind me of dorms. It would be so hard to get back into that frame of mind! I definitely have smaller than 1000 sq feet, but I have more than a shared room.